The Indigo ray of the rainbow symbolizes the bridge between the finite and the infinite and opens the door between the earthly dimension and the spiritual plane. 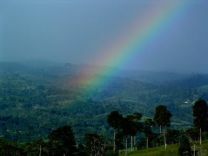 We feel it is thus fitting to feature Rainbows and the Rainbow Bridge Poem in this section. Read about refraction and how rainbows are formed on this page about Rainbows. Each of the colors of the rainbow has its own special Meaning. Find out what they are here. The Meanings of The Different Colors in a Rainbow. The Rainbow Bridge is a beautiful poem written specifically to help pet owners cope with the loss of their loyal companion. It’s a beautiful parable about a paradise where owner and pet are reunited. Just this side of heaven is a place called Rainbow Bridge. Read The Rainbow Bridge Poem and other Rainbow Poems Here. Many different countries and the cultures within them have long told legends, fables and folk tales regarding rainbows.We have stories from The Hawaiian Nation, The Indian Nations, Ireland of course, and even one from Guam. Rainbow myths and legends from around the world!